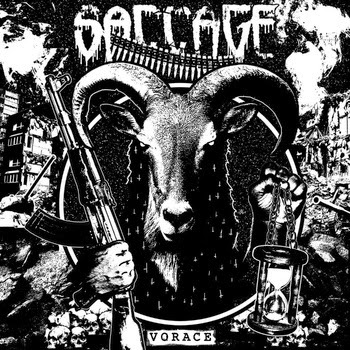 Saccage have been about since 2007 and are following up "Death Crust Satanique" from 2012 with this years "Vorace". The album itself is still yet to become available in physical form, but you can get a free download of it from their Bandcamp page, and it is well worth getting. Very much in the same ballpark as the likes of Toxic Holocaust and Fukpig, these guys blend your regular d-beat, crusty-as-anything grind with death growls, black metal rasps and a shitload of riffage. The vocals though tend to vary a lot more track-to-track than you would get with the likes of Fukpig. It does have the harsh rasping you would expect from grind, but that sprinkling of chanting on "Musique Malsaine Pour Monde A Problemes" (which according to Google translates as 'Unhealthy Music For A World Problems', which probably isn't too far off) gives Saccage something else, as well as the growls and shrieks to be found throughout the release. It is only a four track release, hence this blog being maybe not as long as they usually are, but it is completely free to download from their Bandcamp page and I really enjoy it. Definitely one to check out, and if you do fancy a bit of a speculative spend, give "Death Crust Satanique" a go too. And click on www.londonwebmaps.co.uk - the site I work on for my job. More blog stuff coming soon, not sure what it'll be looking at but there are some cracking releases I've got hold of recently. Keep your eyes peeled!